Measuring ø310 mm (the same size as those of the Z1000), the Z400/250’s semi-floating front disc offers sure stopping power. A rigid new front brake master cylinder helps eliminate ineffective (idle) stroke, contributing to controllability, while carefully selected brake hose dimensions and material contribute to brake touch. All models are equipped with ABS and feature the latest ABS unit from Nissin, the most compact and lightweight available. While seat height is 785 mm (when radial tyres are fitted), the slim design of both the seat (30 mm narrower) and the rear of the engine gives riders an unobstructed line for their feet to reach the ground. Designing the engine from scratch allowed the engine layout to be optimised for size, weight and efficiency. The new engine is comparable in size to that of the 2013-2018 Z250. Numerous weight reduction efforts keep weight to a minimum – despite a larger displacement. The clean design trimmed of any unnecessary items, and the revamped layout enable a slim engine and a cooling system with minimised external piping. More compact clutch (ø139 mm >> ø125 mm) with less rigid operating plates offers a lighter lever pull. Complementing the extremely light feel at the lever, the new clutch has a wider engagement range, facilitating control. Displacing 399 cm3, the new engine delivers significantly increased performance compared to its predecessor: 33.4 kW (+4.4 kW vs the 2018 Z300). The higher performance can largely be credited to the new downdraft intake, which is accompanied by a larger airbox offering increased intake efficiency. The increased performance is complemented by a rider-friendly character; the smooth response and abundant low-end torque facilitate throttle control for new and experienced riders alike. 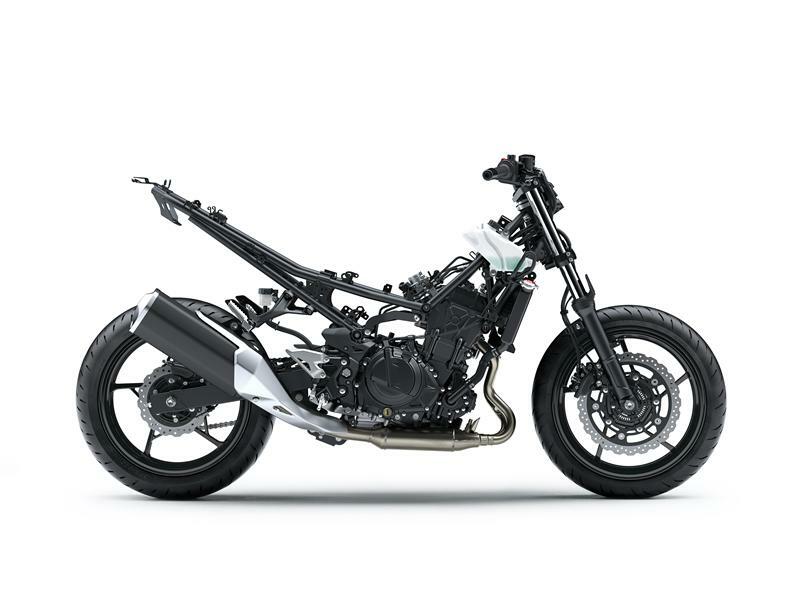 The lightweight design of the new engine and frame, plus extensive efforts to minimise weight result in a curb mass of only 167 kg for the Z400 (3 kg lighter than the Z300) – making them the lightest twin-cylinder models in their class. Relaxed rider triangle accommodates a wide range of rider sizes and riding situations, contributing to its rider-friendly character. The relatively upright riding position and wider handlebar put the rider in the ideal position for active control, facilitating dynamic, sporty riding. With both the engine and frame being new, engine placement could also be optimised. The new chassis features a short-wheelbase/long-swingarm design, complemented by a steep caster angle that delivers light, natural handling. The bike’s light weight also contributes to the easy handling and facilitates manoeuvring when off the bike. In addition to contributing to the Z400’s sharp looks, the newly designed LED headlamp is highly visible and offers significantly increased brightness and a wider illuminated path.